We’ve expanded late fee support in Rentec Direct’s property management platform to include new advanced options, yet still maintain a very simple and intuitive interface. As can be seen in the screenshot on the right, the same monthly late fee and daily late fee settings are available. Just like before you can select either of these and the system will charge accordingly. What’s new? You can now select both options and the system will charge the monthly late fee as soon as the grace period expires, and follow each day after with the specified daily late fee. In addition an option for late fee maximum has been added to provide a way to cap the maximum late fee. As shown in the example in the screenshot a $25 late fee would charge to the tenant on the day following their grace period. The day after a $5 daily late fee would accrue until a maximum of $40 was charged. This would amount to the initial $25 charge, plus 3 additional $5 charges to equal the maximum of $40 at which point the system would stop. Another improvement we introduced with this release is the system will not include the current month’s late fees in the calculation to determine if the tenant owes late fees. For instance, if the tenant pays all rent and other charges, minus the current month’s late fees, no further late fees will be imposed. This is to comply with most state regulations and practices. All previous late fee settings have been preserved. 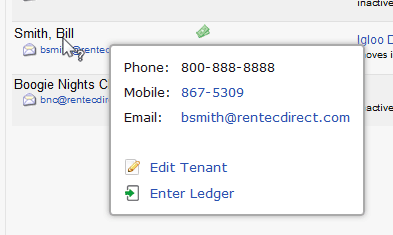 To use the system, edit the tenant and click on the ‘edit fees’ link in the same location where late fees were specified.